Azure Collier is the social media marketing manager for Constant Contact, an email marketing service provider that works with many small businesses and non-profits. Today we are talking about how B2B’s can successfully use Pinterest. Constant Contact began using Pinterest in 2012, to see if they could grow their business. It has been a source of tremendous growth for their blog. Each month, it is a toss up between Pinterest and Facebook as far as driving traffic to their blog, which is interesting because they have almost twice the number of Facebook followers as Pinterest followers. Simply put, it is a business that sells products or services to other businesses. Constant Contact sells email marketing services to other businesses. Constant Contact uses Pinterest to bookmark and create helpful resources for their clients. Because Google indexes Pins, your content can come up not only in Pinterest searches, but also in Google searches. This extends the life of your Pins indefinitely, while allowing people to access your content and leading them to your website. Azure spends some time each day creating Pinterest worthy images for their company blog posts. They also create guides, which are visually pleasing. Azure works carefully with their blog editor to figure out what is driving their blog traffic; she periodically takes a look at their boards- the titles, and what is being Pinned to those boards, to be sure that their keyword use is consistent with what people are searching. They title their Pinterest boards based on search-ability. In order to rank higher in Google searches, Azure Pins a lot of email templates; this insures that if someone does a Google image search for “email template” or “email marketing template”, Constant Contact’s templates are going to show up. Infographics and slide-shares have been a huge success for Constant Contact. Their “social media image size guide” has been their top created content Pin. That post has been shared more than 6,000 times from their blog alone. Even though Constant Contact is an email marketing company, they realize that people use email and social media together, so they try to create a lot of content for all the social media platforms to meet the needs of their clients. Another post that did really well for them was a post for non-profits that was a slide-share of “30 Tips for End of Year Fund-Raising.” From the blog post alone, that content has been shared 21,000 times on Pinterest!! Azure recommends that you create a board from the individual slides in your slide share. Tag the person that you are quoting in your slides. If you tag the person you have quoted, that person is more likely to comment on it and even share it themselves. So now not only has your audience seen it, but their audience is seeing it as well. Azure is a huge fan of the Tailwind scheduler. Because of all the updates that Tailwind has made over the past couple of years, they have been invaluable in helping her plan the Pins going out by providing tools to show the best times to Pin. Learn more about how to master Tailwind. Pinning at the highest traffic times helps Constant Contact to insure that their content is getting seen. While the Smart Feed has taken some of the timeliness out of live Pinning, timing still matters on Pinterest. There are optimal times and days to Pin, so Azure is taking advantage of that. It is important to check your analytics to see which of your boards are the most popular at which times and days, and post to them and share them at those times. Is Pinterest a Relevant Platform for Marketers? A recent study that showed that marketers were moving away from Pinterest. So is Pinterest a relevant platform for marketers? And why? 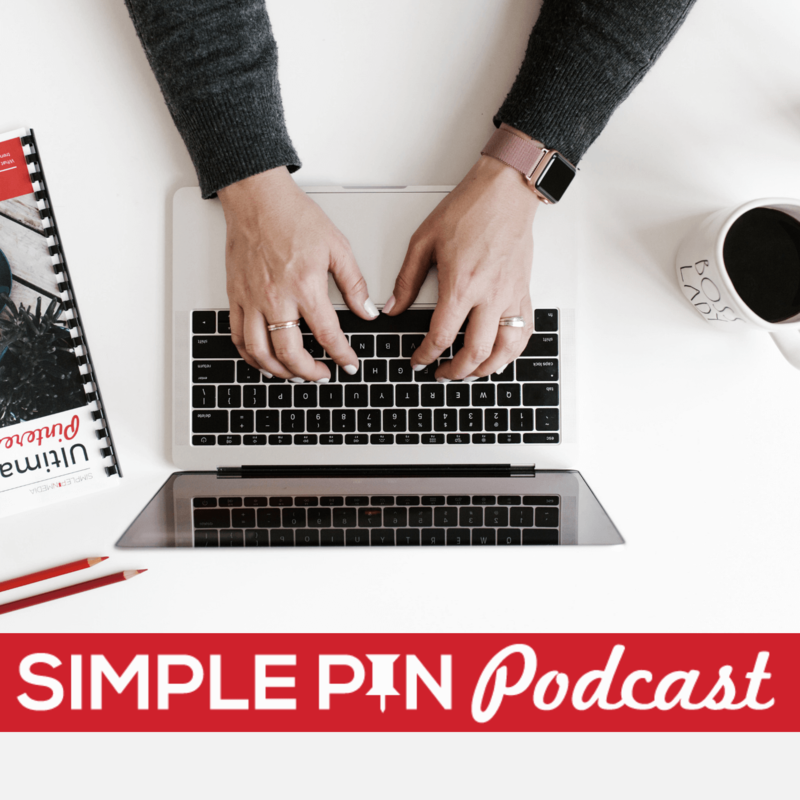 Because Pinterest is a long term platform, with 30% of clicks happening a month or more after the Pin goes live, some people aren’t giving it enough time to take off. It’s so important to know your audience and to give them what they want. Think about the searchability of your content. It will continue to live in both Google and Pinterest searches. Give the content time to get into the system, get clicked on, get searched. Other social media platforms, like Facebook or Twitter, are more immediate platforms. Your posts either get seen within the first few hours or they don’t. Regardless, you have to put something new out there. With Pinterest, that content lives on. Learn more about how SEO and Pinterest are related. Businesses need to have a consistent presence on Pinterest. It isn’t enough to put up a few boards and then leave them. If you aren’t sure what to Pin, then begin to spend a few minutes per day curating great content to share. If you share something on another social media platform, you can also Pin that content. If you don’t have a Pinterest friendly image for your post, it won’t get Pinned. Be sure to create Pinterest friendly images for all of your content. If you don’t want that vertical, Pinterest friendly image in the post itself, use plugins that enable you to keep the image hidden. It will still show when it is being pinned, but won’t show in the post itself. Images aren’t only important for Pinterest. Twitter and Facebook are also becoming more and more dependent on images for content to be noticed. If you aren’t creating images for your content, you are likely missing out on a lot of possible shares. Don’t know where to start? Try a website like Canva (free) or PicMonkey (inexpensive). Both are extremely user friendly. With Canva, you have the advantage of them being integrated with Tailwind, so you don’t even have to leave your scheduler to work on images. Find out what your audience is Pinning from your website. Remember, you don’t have to be on Pinterest for people to be sharing your content. If you already have a blog or website filled with beautiful images and content, those are future Pins that you could be creating. To get this information, go to pinterest.com/source/*your website*.com. So if Azure was doing this, she would go to pinterest.com/source/constantcontact.com. This shows you exactly what content people are Pinning from your site. Use this information in creating new content and new boards. Once you know what people are already coming to your site for, you can create more of the same content. If you like creating a certain type of image but your audience consistently Pins a different image for your content, you need to follow the audience. The slide shares that Constant Contact creates are a great example of this. Who knew that slide shares would be so popular? But that’s what the audience likes, so they create more of them. Keep in mind too, that people access Pinterest from many different devices, whether that is iPhone, iPad, Android phone, Android tablets, desktop, etc. And they each change what you see when you go to your Pinterest page. Especially if you are a B2B, remember that you may be on your desktop a majority of the time working on your business, but only 20% of Pinterest users are on a desktop when they are looking at Pinterest. If you use a lot of infographics, be sure of how they show up in mobile. If the entire infographic won’t fit in the image, check to be sure that the top of the graphic is showing. If you check your Pinterest analytics and see that a lot of your users are on mobile, then check your website and see how things look on mobile. Is your website friendly to those wanting to Pin from a mobile device? And if someone clicks through to your website from Pinterest, is your site mobile friendly so that they can continue to click around on your site? Because Pinterest is a visual feed, you want to dominate that feed with your images. Create large, visually pleasing Pins that get noticed. Azure prefers creating Pins with Canva’s standard size for blog posts. Make sure that your blog or website are actually Pinnable. Have those images sized correctly; be consistent in your branding. If your post has no images, then create an image using the post title. If you are a B2B and you aren’t currently using Pinterest for your business, go create a Pinterest page and create 10 boards that you know will be well received for your business audience. And be sure to visit Constant Contact to see the amazing things that Azure has done with their business. 3:20- What is a B2B? 16:30- Is Pinterest Relevant to Marketers? Questions? Comments? Tips? Join the fun below.